It's Your Birthday...Have A Blast! Traditionally, credit for a photographic image goes to the person who arranges the technology and snaps the shutter. In reality, when a photographer works closely with a model, a creative collaboration takes place. The creative energy can express itself in many ways. 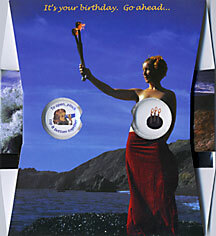 The inspiration for these images came from fire performer Sarah Goody's vision of her art immortalized in a stereo photo. The photographer found the right rock on the right beach, and spent a long time standing up to his waist in the cold Pacific waters of Marin County snapping away as Sarah made magic above him.